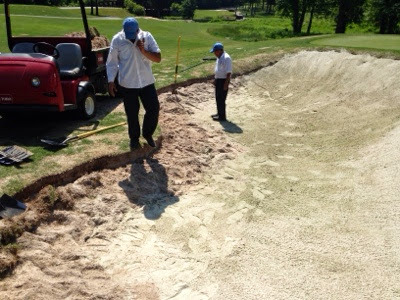 The guys are working on reclaiming the bottom edge of the bunker. We have worked on several of these over the last four weeks. Playability for a couple of weeks after the work has been done can make the sand softer than normal. A few plugged or buried balls maybe seen during this time. With water and packing the issue will go away and will play like normal.